Skype for Windows 8 was re-architected from the ground up, said Derek Snyder, head of Mobile Marketing at Skype. (Before joining Skype, Snyder was Executive Communications Manager &amp; Technical Advisor for Windows Phone.) Remember those stories about Skype moving away from a pure peer-to-peer (P2P) model, to more of a hybrid model? That's exactly what's happened. On the back-end, in the months after Microsoft's acquisition of Skype was finalized, the pair have been moving Skype to use the Windows Messenger infrastructure. 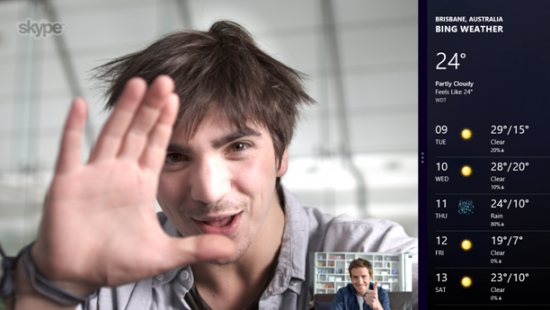 Storage of pictures, video and other Skype content is now happening on Windows Azure. In the longer term, Skype most likely will replace Messenger some day. There's no public timetable as to when that will happen, but Skype recently began testing new Windows and Mac beta releases that allow users to sign in using their Windows Live ID (Microsoft Account) so they can send and receive instant messages and see presence information from those using Messenger. On the front end, the user interface in Skype for Winows 8 has been overhauled so it has a true Metro/tiled look and feel. (The Skype team is using "Modern" to refer to this look, though that is not the official Microsoft replacement term for the Metro UI.) The Windows 8 version of Skype is less Facebook-centric, Snyder said, though Facebook integration is still a feature. Skype for Windows 8 takes advantage of all the usual Windows 8 features, such "snapping" so Skype can run side-by-side with another app; integrating with Bing allowing image searching and association inside Skype; and running in the background in a low-power-consumption but always-on mode. Skype plans to continue to offer users a multiplatform experience. Expect more enhancements on platforms other than Windows 8 and Windows Phone 8 to continue. There's still no public timetable as to when Skype will be fully integrated and federated with Lync. But it's coming. "But expect to see more mobile-specific, mobile-first from us, going forward," said Snyder. Skype is planning to provide lots of tips and how-to content to help users figure out how to take advantage of Windows 8-specific features with Skype. These will range from things like "what are toasts?" to "how to put Skype on your lock screen." Skype is aiming to get users to leave Skype running on their machines all day and use chat as the first place they go when they sign in. "Later this fall" Skype will be adding a video-messaging capability to Skype for Windows 8, via which users will be able to leave "a small video message" for their Skype buddies, Snyder said.